I did a little ink blending for this background panel, I added a layer of black cardstock in behind and left a large white frame on the card base. I ink blended the background with distress inks, created some water spots in the blended ink then added further interest with splatters of white and black watercolour ink. I also did the same with some gold and silver. 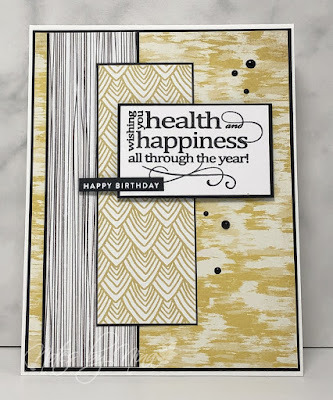 The sentiment is white heat embosses on black cardstock and popped up with foam tape then a few sequins to finish. The card base looks cream in the photo unfortunately, it is white in actuality. 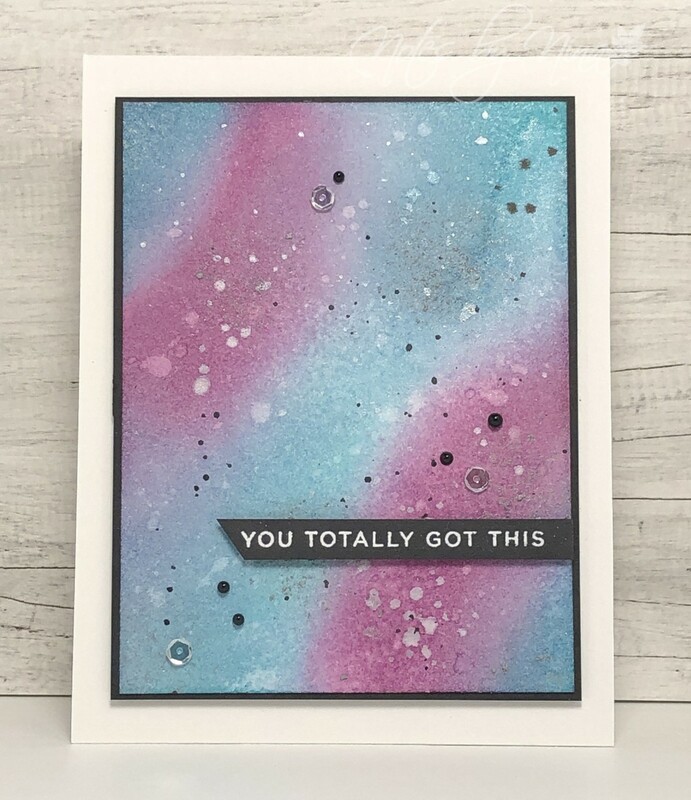 Supplies: White and Black cardstock, Distress inks, Hero Arts liquid watercolour (White and Black), Gansai Tambi watercolours, sequins. 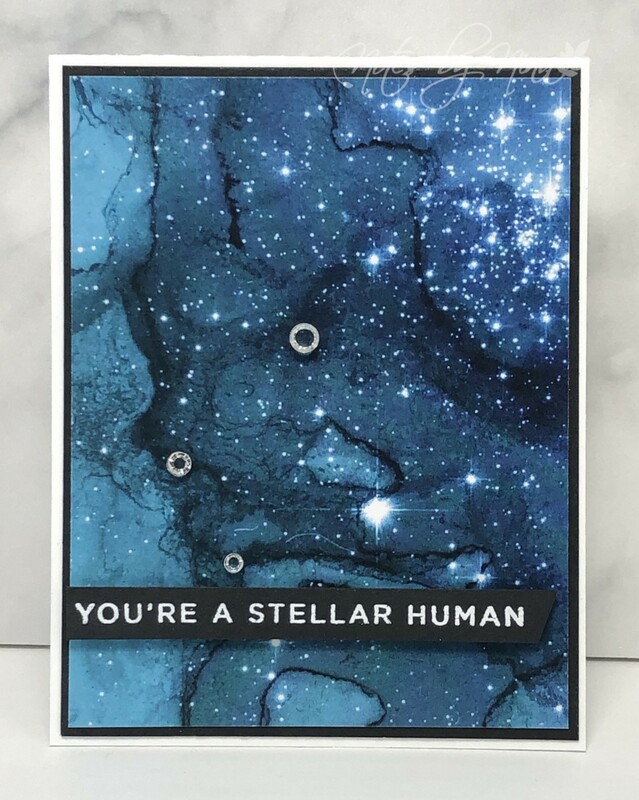 I brought this cool pack of galaxy paper on a whim, when it arrived I really was not sure what I was going to make with it. It only sat on the edge of my desk before I had an idea. In truth I let the paper do all the work, I think perhaps that is why I love patterned papers so much, they can make cardmaking so easy. I cut a piece of designer paper into the desired size then added a piece of black cardstock in behind. 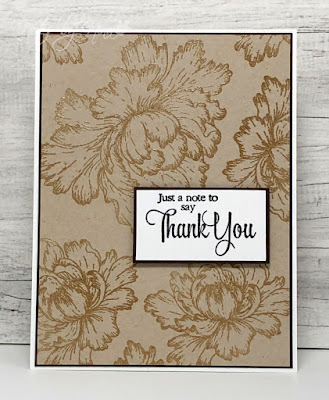 The sentiment is heat embossed in white on black cardstock, in my opinion the sentiment matches the DP perfectly. I finished by adding some clear gems. 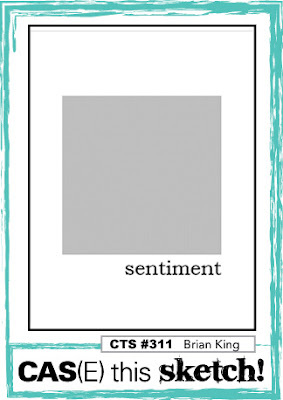 Supplies: White and black cardstock, Designer Paper - Brutus Monroe, Simon Say Stamps - Simple Sentiments No.01, clear gems. Ohh poor blog, poor craft space too. I have not spent too much time as of late with my paper and inks. When I have had time to create I have been pretty lax about posting. 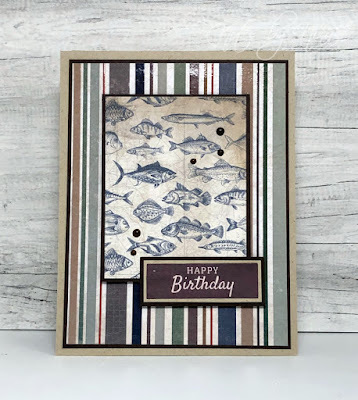 I put this card together a couple of weeks ago, it is such a simple design but I like the way it came together. I have had this paper pad in my stash for a long time. 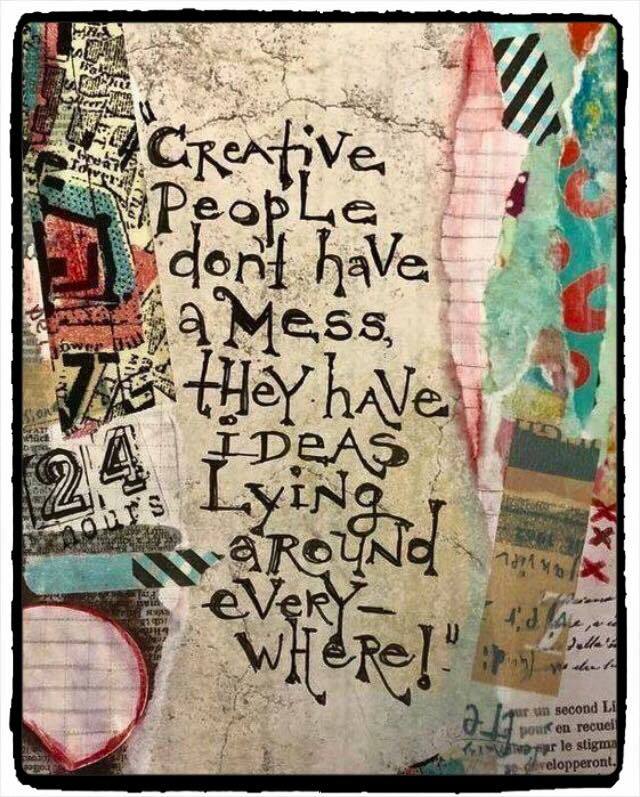 I have started to look through things that have been around for a bit and either use them or start to de-clutter a little. It is way too easy to get excited about new stuff but I have also seen a bunch of what is old is new type items making the rounds again. This card is slightly smaller than an A2 size, it was created to fit a specific envelope I had on my desk. I used a piece of black cardstock for the panel base, then cut a piece of designer paper to fit it. I cut a thin piece out of the DP panel to separate the top and bottom panels. Both panels have foam tape in behind to give it some dimension. In the space left behind I wrapped some crochet thread around a few times. I heat embossed the sentiment in white on black cardstock then popped it up with foam tape. I finished with some clear dew drops. 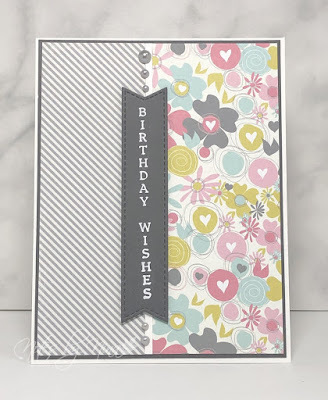 Supplies: White and black cardstock, Designer Paper - Bo Bunny, Simon Says Stamp - Tiny Words, dew drops. Welcome back for the March edition of the Keeping Christmas Series. 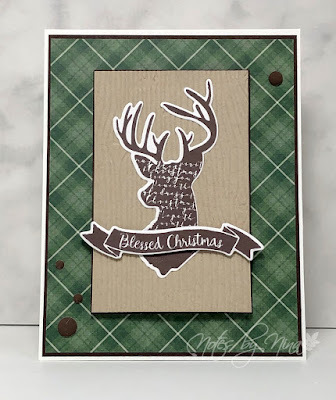 Its been a little while since I posted, but I am excited about this card for the Keeping Christmas blog hop. 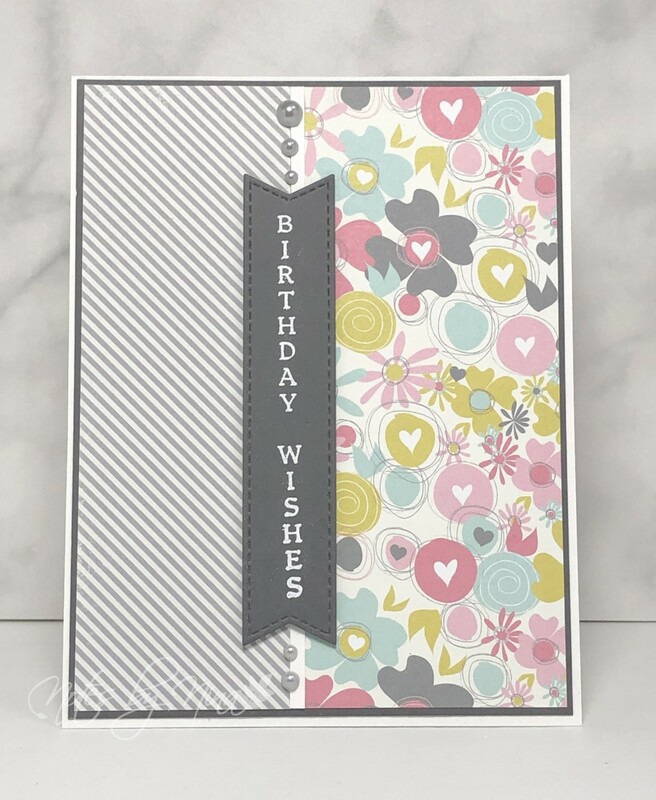 This is quick and easy card, I used pages from a 6x6 paper pad. I added a layer of black cardstock to each panel for a small frame. I have popped up the top panel with foam tape and I finished with some twine and some clear Nuvo on my star. 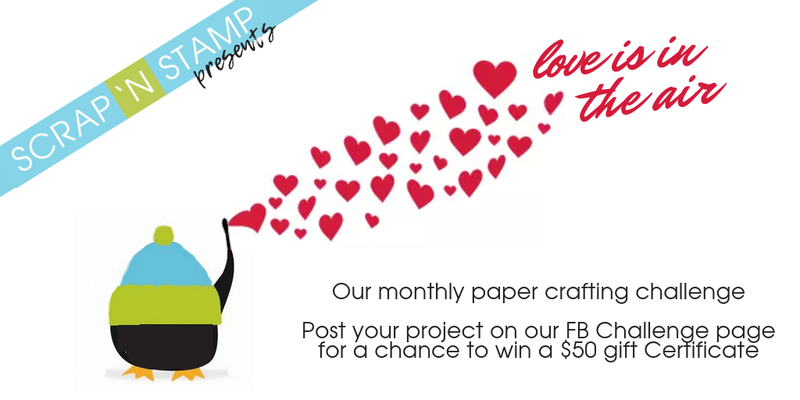 Be sure to stop to see all the hop team member's creations. A short post this morning, I forgot to prep and post my card when I played along with the current Freshly Made Sketches on Saturday. I was distracted by housework and beautiful sunshine. I love this sketch, it is perfect for the CAS masculine card I put together. I started with heat embossing the pattern for the circles in a navy blue. I used a punch to cut the circles out. The top circle is popped up with foam tape. I added some texture to the strip of blue, I added the sentiment then finished with some Nuvo Drops. 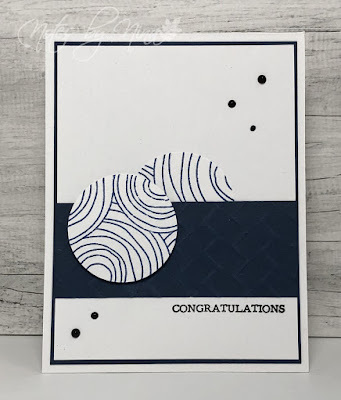 Supplies: White and Navy cardstock, Simon Says Stamp - Circle Doodle Background - Miniature Type, Nuvo drops. I love it when you find a piece of designer paper that does all the work for you. I used my stitched die cuts to create the main panel. I framed it with a layer of brown cardstock. The sentiment is stamped on matching a piece of scrap then layered and popped up with foam tape. I finished with some sequins. The picture is a little light, the colours are a little more vibrant. 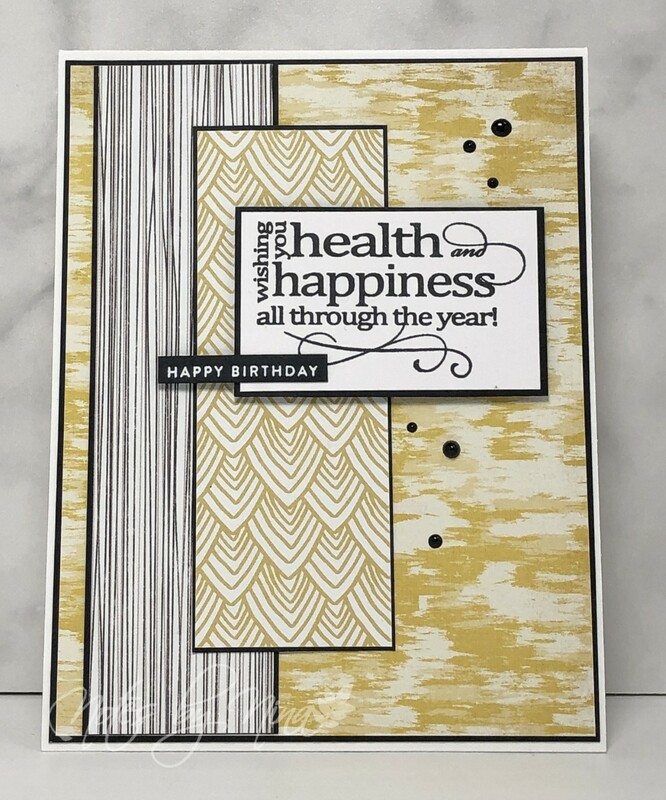 Supplies: White and brown cardstock, Designer Paper - My Mind's Eye, Stampendous - Greetings Galore, Sequins. Happy Friday, I am fortunate enough to have my weekend off work. I am looking forward to some sunshine, outdoors and crafting at some point. 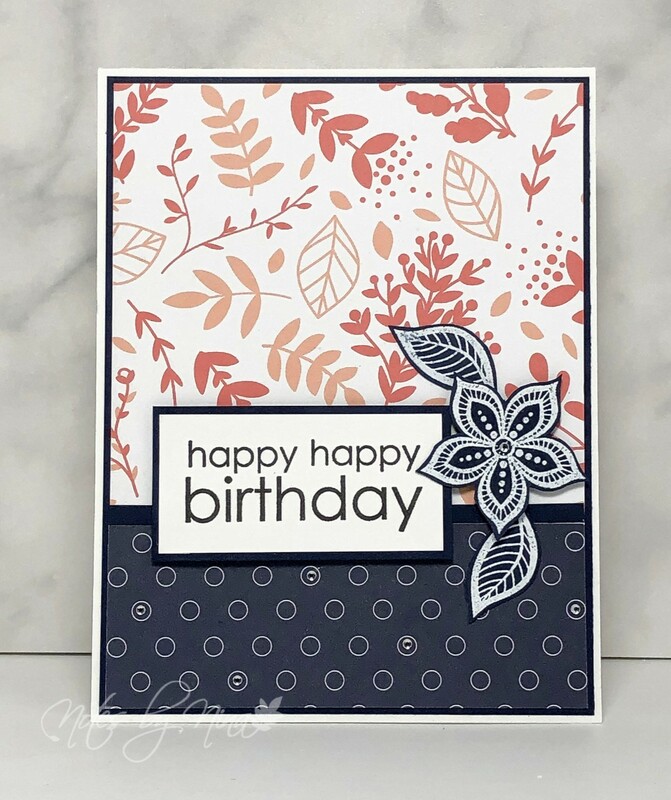 I created this card for a sketch challenge but went way off design, crafting gone the wild side and colouring way way outside the lines. I used Distress Oxides for the background panel then I die cut the circles. 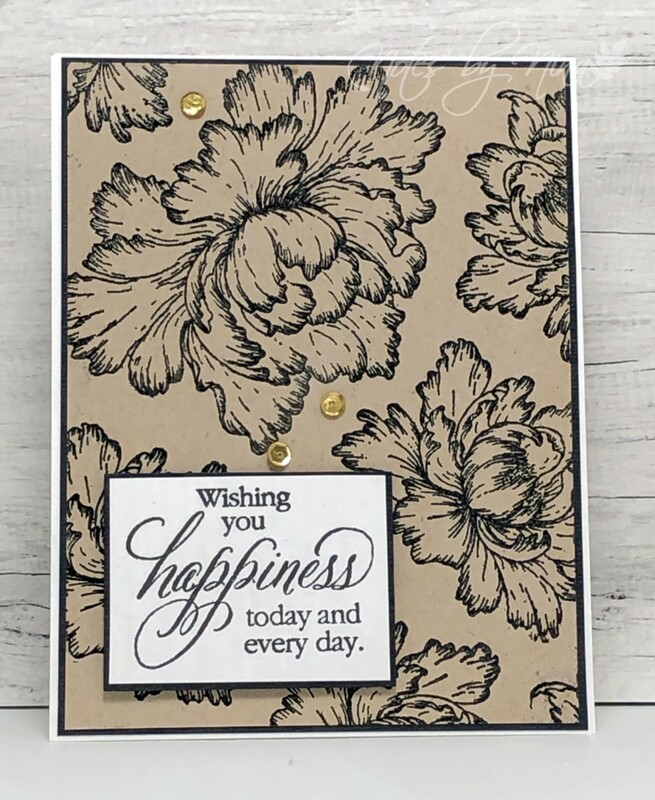 The top flowers are popped up with some foam tape, they were unplanned as I had adhered the top panel on backwards and the stamps did not fit into the die cut space so that is when the whole card just morphed. I then stamped the rest of the flower images. I stamped both of the sentiments. The top panel is popped up with foam tape and there is a hint of sparkle on the flowers, and then finished with some dew drops. 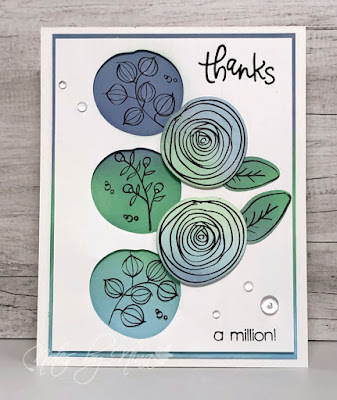 Supplies: White cardstock, Simon SaysStamps - Sketch Ranunculus and Thanks, clear drops. 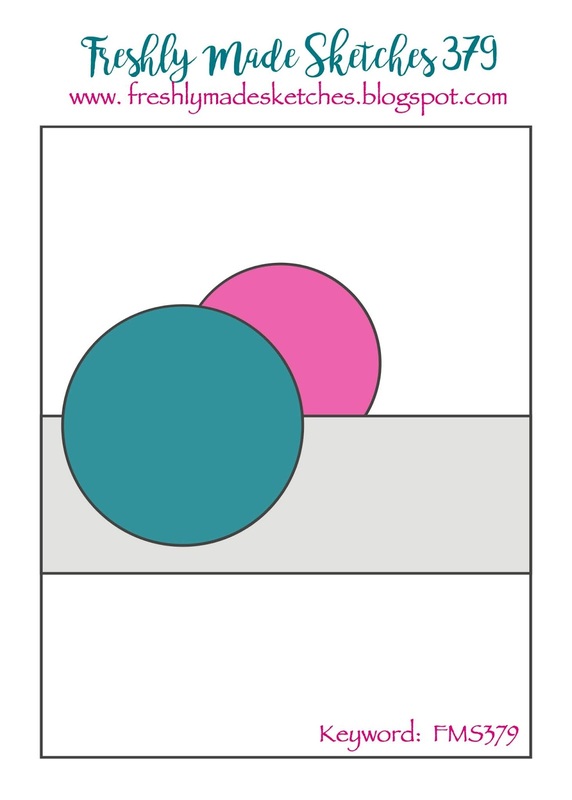 Simple masculine cards are one of my favourites and this one came together very quickly. 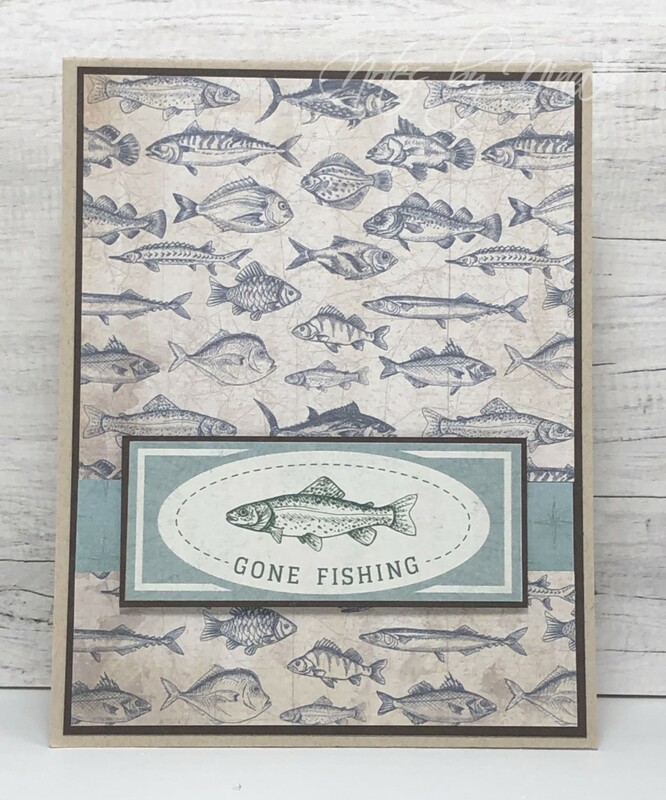 I used a kraft cardstock base then added a layer of brown cardstock to frame the patterned paper. I added a thin strip of the coordinating paper for added interest. The sentiment panel is part of the 6x6 paper pad and I layered it then popped it up with foam tape. 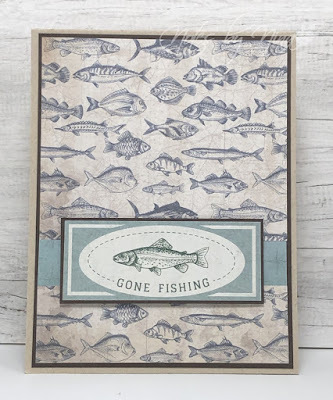 Supplies: Kraft and brown cardstock, Designer Paper - Kaisercraft. 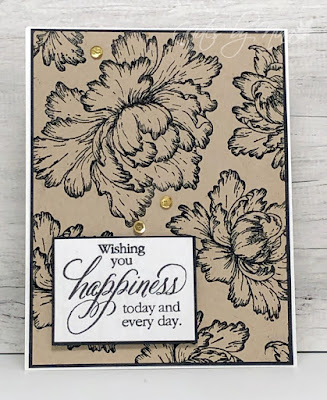 A quick card to share, this is the second panel I created with the Heartfelt stamps set Peony Bud, this time I used black embossing powder. I added a layer of black cardstock for the frame, I stamped the sentiment then added a layer of black cardstock before popping it up with foam tape. I finished with some gold sequins. 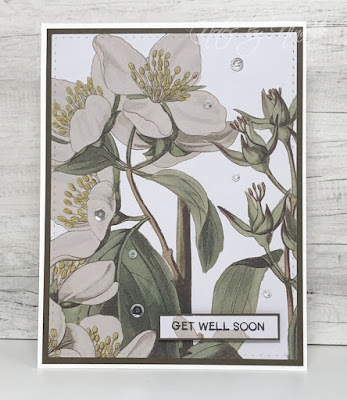 Supplies: White, black and kraft cardstock, Heartfelt Creations - Peony Bud and Blossom Cling, Penny black, sequins. I had a chance to get crafty with my sister yesterday. I love modern technology when you can spend a couple of hrs on Facetime crafting together. We played along with the current CAS(E) this sketch! I love this simple design. I chose to go down the masculine card path, I used a kraft base and layered each panel with brown cardstock. The center panel is popped up with foam tape and I finished with Nuvo Drops. 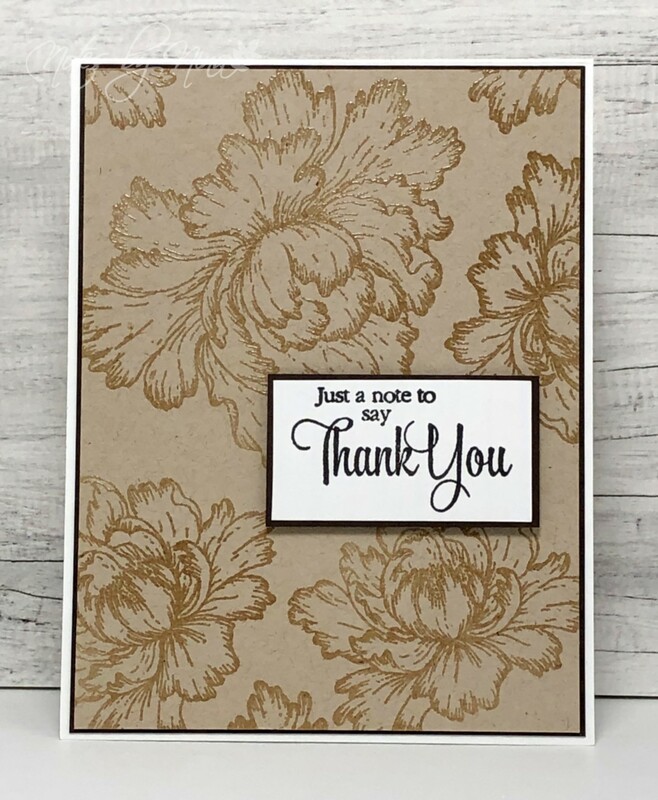 Supplies: Kraft and brown cardstock, Designer Paper - Kaisercraft, Nuvo Drops. 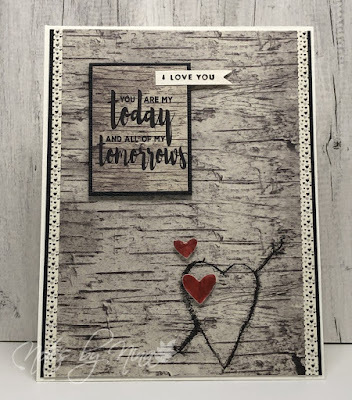 I had my first experience with Heartfelt Creations stamps a couple of weeks ago at a craft retreat. 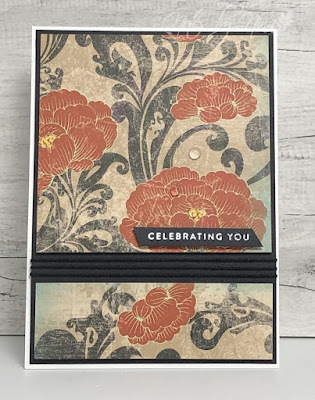 Although I am not going to run out and buy any sets just yet I did love the way they stamped. I took advantage of having access to the stamps and made a couple of backgrounds. 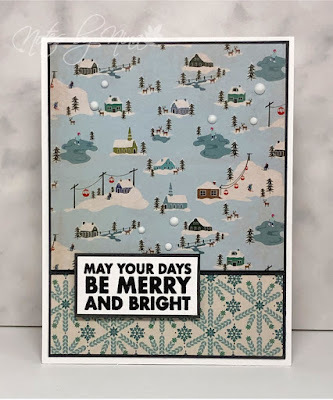 I used my Misti to line the stamps up to get a good impression then I used a stamp block for the small corner placements. I used Versamark ink with some clear embossing powder. I added a layer of black cardstock for a frame. 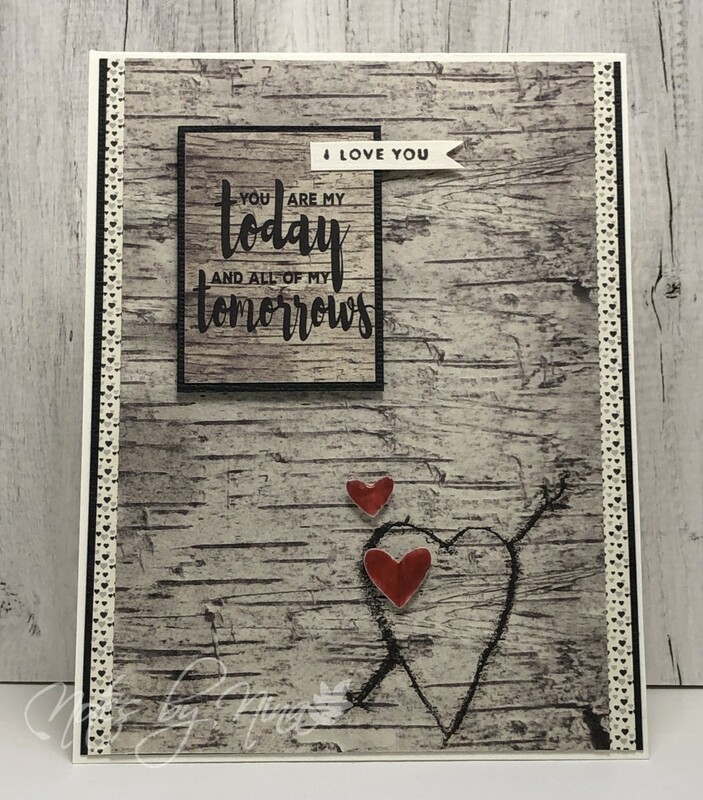 I stamped the sentiment then added a layer of black cardstock to that as well then popped it up with foam tape. I still might add a little something like sequins to jazz it up a bit. 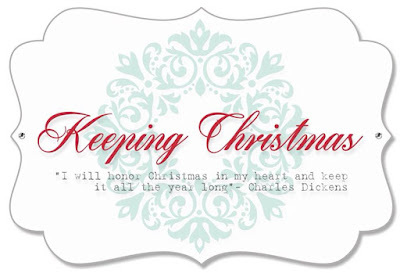 Welcome back for the February edition of the Keeping Christmas Series. 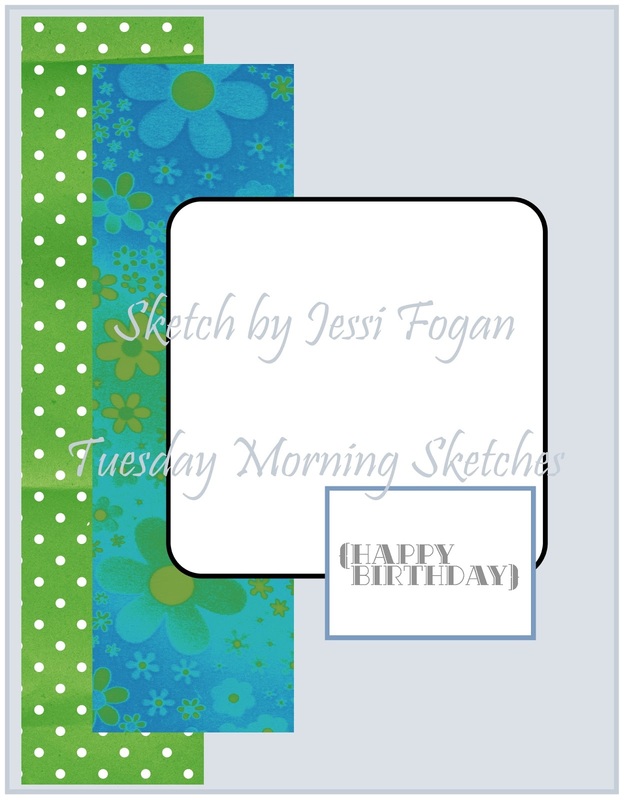 For this card, I used a simple layout that would be easy to reproduce or make multiple cards. 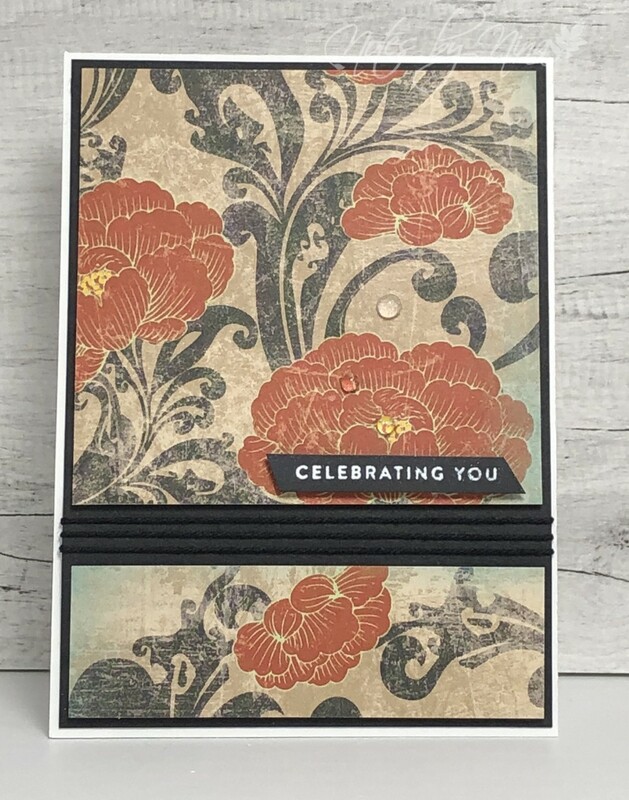 I started with a grey panel then added two smaller panels of designer paper, in this case, it was a double-sided sheet which makes it easy to match. I leave a small strip of cardstock visible between the two panels for an added element. I heat embossed the sentiment and layered it with more grey cardstock then popped it up with foam tape. I finished the card with some white Nuvo drops. 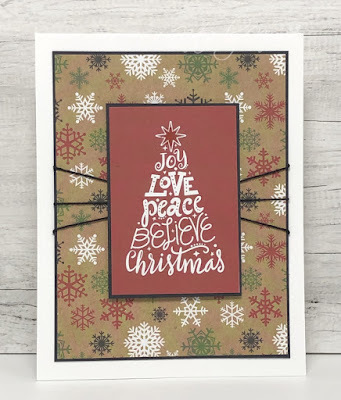 Supplies: White and grey cardstock, Designer Paper Authentique, Hero Art - Poster Christmas Carol, Nuvo Drops. Be sure to visit all the team members blogs to see what they have created. Good evening.. My goodness what a day, I was so busy at work today I am sure I looked like an owl most of the day - head spinning and wide-eyed.. and I thought it was Thursday which made me spin faster J. I don’t remember if I have ever been happy for it to actually be a Wednesday rather than a Thursday at work…. Ever. Anyway.. enough of that nonsense ;) I am taking it down to the wire to play along with the Scrap 'n Stamp January Challenge. My card is pretty darn simple. I used a couple of pages from an Authentique 6x6 paper pack, I added a layer of black cardstock to both panels. The sentiment panel is popped up with foam tape and I an itty bitty little flag sentiment add-on. I finished by popping up a couple of hearts covered in Nuvo drops.. Voila a Valentine's Day card for my hunny. Supplies: Cream and black cardstock, Designer Paper - Authentique, Simons Says Stamp - Tiny Words, Nuvo Drops. Wishing you a happy happy anything on this fabulous Tuesday.. well I hope this will be a fabulous Tuesday but this is scheduled to post at 5am to lets cross our fingers ;). I am in love with this Boho Flowers stamp set from Gina K Designs. 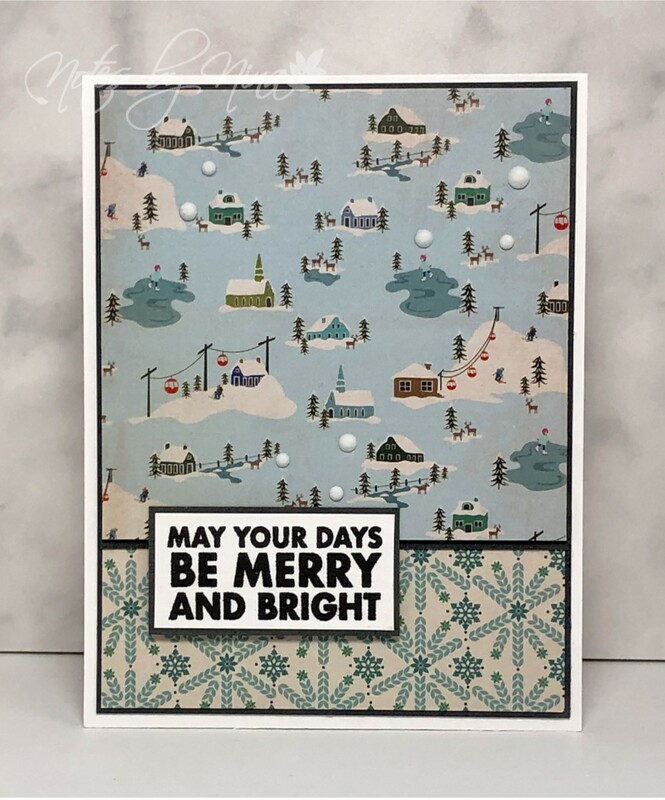 I used both sides of a DCWV for the background panel of this card. I left a small blank space between the panels. 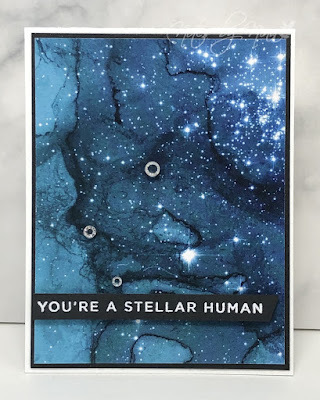 I layered the sentiment panel and popped it up with foam tape. The flowers and leaves are heat embossed and the flower is layered with foam tape, I finished the card with some little gems. 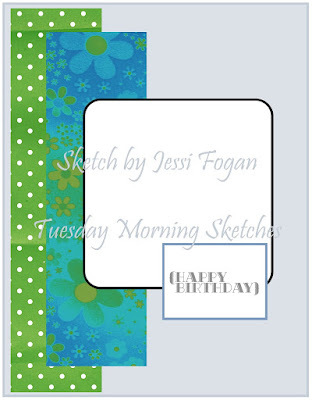 Supplies: White and navy cardstock, Designer Paper - DCWV, Papertry Ink - Birthday Bash, Gina K Designers - Boho Flowers. Birthday wishes on a Sunday. I have a quick crafty post this morning. I wanted to try something a little different for this layout, I love the foliage on this double-sided DP. I layered the panels with a dark green cardstock and left a space down the diagonal centre. The sentiment panel is popped up with foam tape to finish. 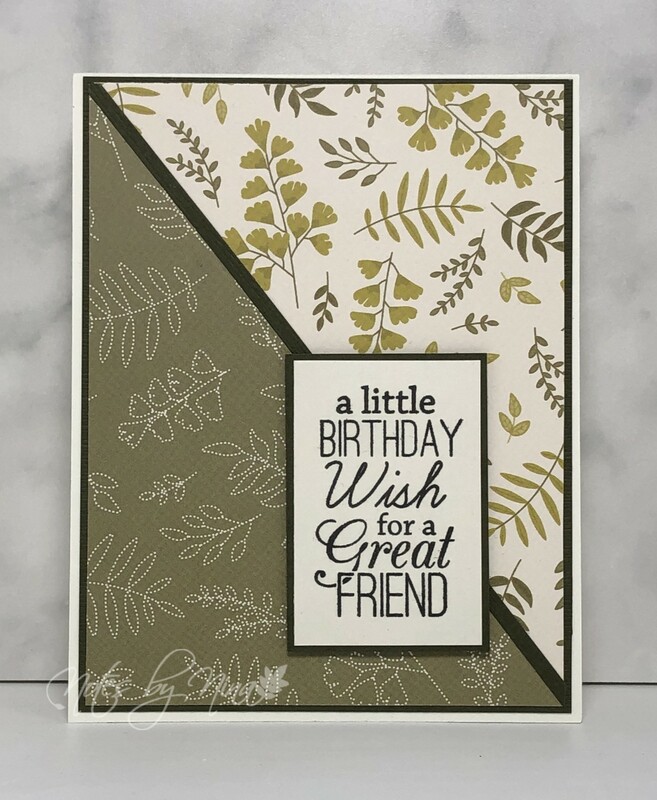 Supplies: Cream and green cardstock, Designer Paper - Jen Hadfield, MTF - Birthday Greetings. Happy Saturday - I have a really quick post today. I am excited to be headed for a crop. Wish me luck with some crafty karma as I have not been feeling overly creative lately and I am hoping to be inspired. This is a pretty simple layout, I used a couple pieces from a 6x6 paper pad then added a pretty grey layer to added a small frame. 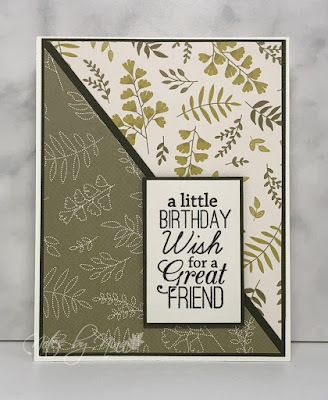 I used the same grey cardstock to heat emboss a sentiment in white. I finished with some light grey half pearls. 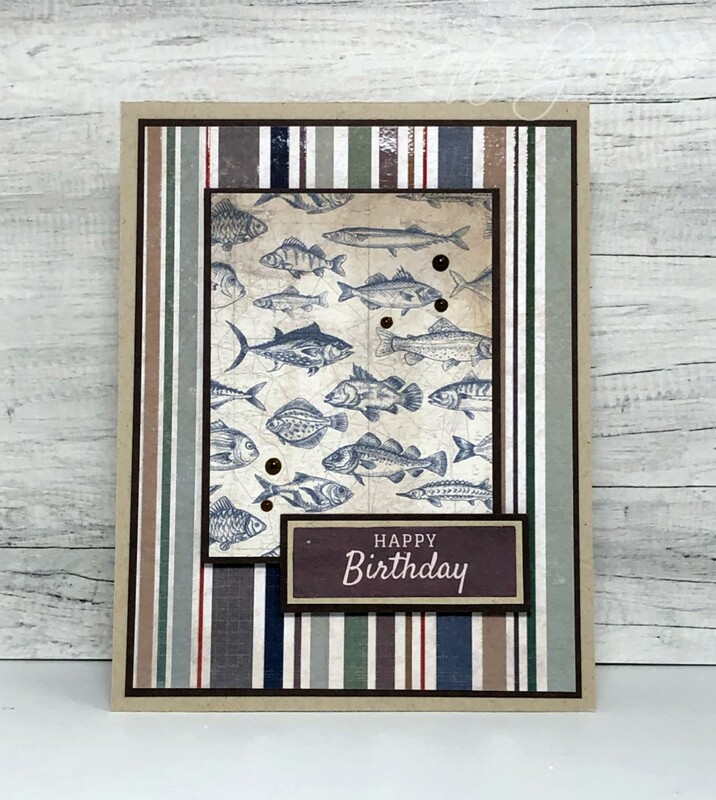 Supplies: White and Grey cardstock, Designer Paper - Fancy Pants, DRS Designers - Birthday Wishes, MTF - Stitched Fishtail Sentiment. Welcome back for the January edition of the Keeping Christmas Series. I made this card with a masculine feel. Using a layer of brown cardstock to frame the Designer Paper. The green plaid is a great backdrop for the focal element panel. I added a woodgrain texture to the kraft cardstock and layered it with brown cardstock, This panel has a layer of foam tape to pop it up. 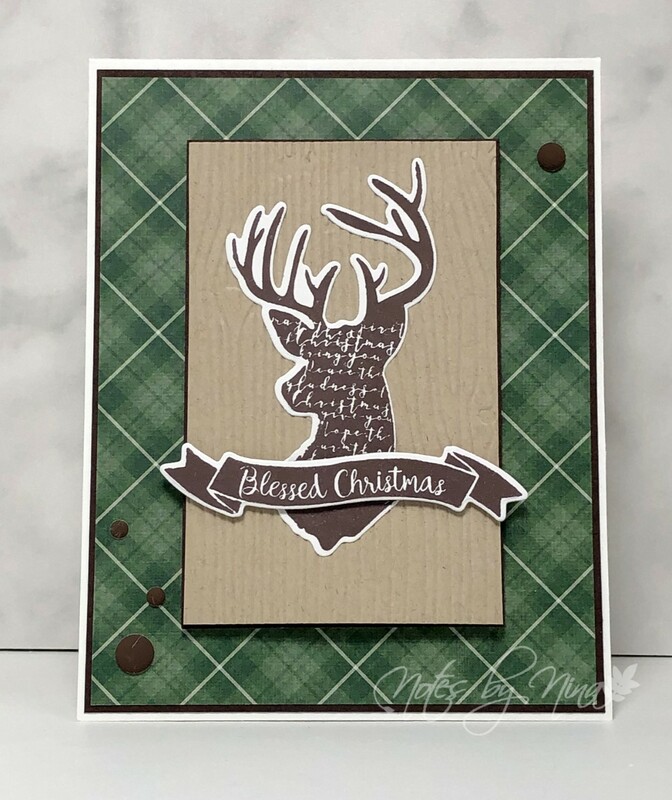 I stamped and die cut the buck and sentiment, I then added a layer of foam tape to the sentiment. The card is finished with some matt brown dots. 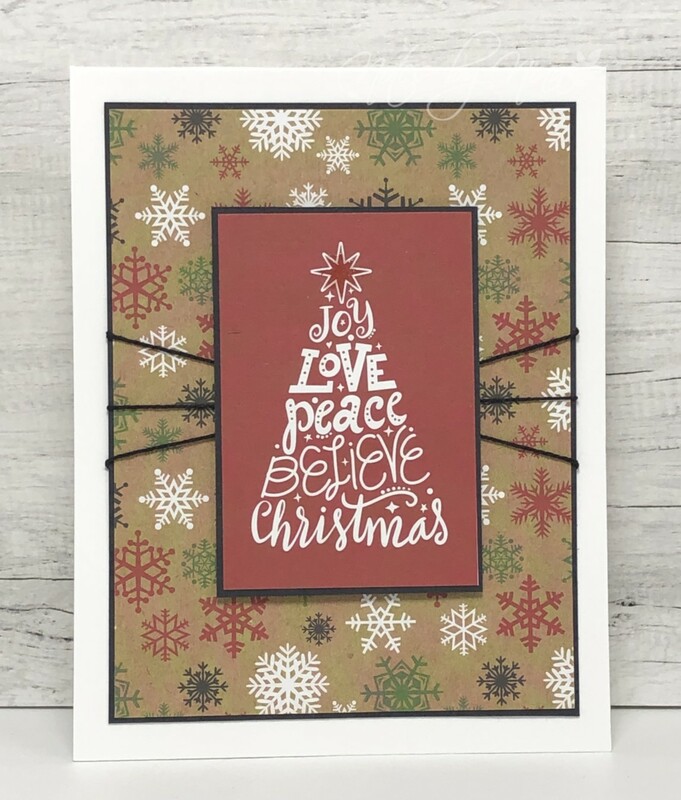 Supplies: White, brown and kraft cardstock, Designer Paper - PhotoPlay, Simon Says Stamp - Magical Christmas, dots.